We slept in a bit at Keith & Jo’s apartment and awoke to a grey overcast Toronto morning. The weather didn’t really motivate us to skip out of the apartment and go sightseeing. Beside which, we still had to sort out the mess with paying the movers. We were both starting to get really frustrated with Fleet, Bank of America, Ayer Moving & Storage, and North American Van Lines. I came up with an idea that at least moved a few things forward. We had tried multiple times to call the 1-800 number on the back of our ATM card to get in touch with a “real person”, and of course failed. So, I called the number again, and this time, instead of pressing buttons that actually mapped to what I wanted to do, I selected options that seemed most likely to lead to speaking to a person. (Here’s a tip: try doing the “Stop Payment” option – guaranteed to help you reach a live person.) It actually worked, and I gave the guy who answered a slice of my sob story, and asked if he would just give me the direct line for our Fleet branch on Mount Auburn Street. He did, and I was able to speak to a live person there in Cambridge. Unfortunately she wasn’t that helpful, but at least I got answers. It turns out that going to a Bank of America wouldn’t do us any good in any case, because the B of A computer systems aren’t talking to the Fleet systems yet. The woman I spoke with in Cambridge also told me that she couldn’t do a wire transfer or cut a cashier’s check over the phone. At best, I could write a letter, have it notarized, and overnight it to the branch to have them cut the check. Although this got us nowhere, at least it narrowed down our options. I called the moving company and told them we’d have to pay with a credit card. Then we got more of a runaround, because of course it’s typically their policy to take credit cards *before* the move, blah blah blah. I ended up having to call the national office for North American Van Lines. Then it got complicated because they needed to fax us a form, and we had to fill it out and fax it back. So instead of going out and visiting Toronto’s many fine museums and sights, we headed back to Keith’s lab to do some paperwork. It would have been a lot more gratifying if the woman at North American called back immediately upon receiving the fax to tell us we’re all set, but since she didn’t, we gave up and went on our merry way. By this time, the sun had burned through the clouds, so it was actually nice to be out and walking around the city. We had lunch at a random wrap place, then went to the Hockey Hall of Fame, the one thing Dave really wanted to see while in Canada. 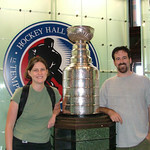 I suspect that for hard-core hockey fans and players, the HHOF is a very cool place. And it may be fun for kids, who completely skip all the displays and head straight for the interactive stuff. But as a person who goes to a lot of museums, I give the Hockey Hall of Fame a thumbs-down. After paying and entering the museum, there’s nothing to orient visitors as to which direction to head, or even what is in the various parts of the museum. So you just sorta wander around, staring at glass cases full of hockey memorabilia. Each item has a detailed explanation in both English and French, but there are so many different items in each case, and so many different cases, it is hard to distinguish what items are actually significant and which are more mundane. Not to mention random typos, misspellings, and omissions of important information (for example: a sign pointing to an item used during the longest hockey game ever neglected to mention what year the game actually took place). So, we wandered around sorta looking at the displays, then went into one of their little theatres to watch a short film about the Stanley Cup. Actually, Dave watched it. I took a nap. I was *very* tired. It was good that I did, because I felt much better afterward. There’s a section in the middle of the Hall of Fame where you can play interactive trivia games, as well as pretend to be a player. Dave did both of the games, first taking shots against a video goalie and then blocking shots from video forwards. I tried taking photos but there was too much glare off the plexiglass to allow the photos to turn out great. Finally we headed for the GOOD part of the Hockey Hall of Fame, the Great Hall, where all the trophies live, including the holy grail of sports championship trophies, the Stanley Cup. The Great Hall was quite beautiful – a nice change from the basement feel of the rest of the museum. This wing of the museum was originally a bank, perhaps 100 years ago. 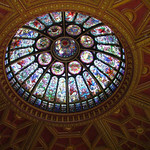 It has a spectacular stained glass dome, and there are tall windows lining the outside walls. All of the trophies are in freestanding glass cases around the room, and each explains what the trophy is for, and also has a blurb about the most recent winner of that particular trophy. It was nice to walk along the lake, enjoying the sunshine and the boats. But after a long day, we got tired after a short while. 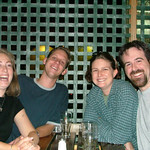 We got in touch with Keith and Joanne and arranged to meet them downtown to go out to dinner. We ended up going to a pub called Duke of Argyle, where we ate pub food, drank beer, and listened to a band play Nova Scotian style music. It was relaxing. Finally, we headed home and went to bed. Could you use a family member to take care of your payment problem, ie. have the family member issue a certified check of which you write them a personal check to pay for it? 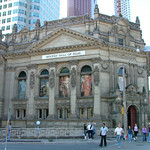 The Hockey Hall of Fame sounds like the BMW museum in Munich. Interesting, but kind of poorly laid out and unfocused. I like how your MA license plate is so defiant to passersby. Can I pass you? NO. Wow, is that a Ford Focus? NO. When I lived in Mass, my license plate ended in HY, clearly revenge earned through my endless mocking of Fresno Armenian HYE license plates. 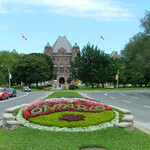 We are thinking of moving to Toronto, so I am looking at your TO pics.